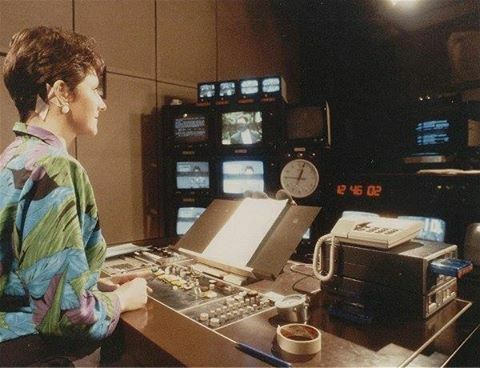 The photo is of Miriam O’Reilly operating the Midlands Today pres desk at Pebble Mill in 1990. This was a year before the big stereoification refurbishment of all the regional pres desks in 1991, which in turn led to the building of the pres gallery next door. Notice the diamond-shaped strips sticking the ear-piece wire to behind Miriam’s ear, probably of toupee tape – I bet those hurt when they were pulled off. There’s also a handy reel of what looks like camera tape on the desk, carefully out of shot, in case of emergencies! Thanks to Stuart Gandy for sharing this photo, which was originally posted on the Pebble Mill Engineers Facebook group.